This book has been republished since it was a big success when it first came out in 2005. Essentially it is about a Church of England bachelor vicar, Francis Oughterard, who in 1957 is sent to act as pastor at St Botolphs, Molehill in Surrey. Here he is quite happy in a quiet community but he is constantly bothered by a Mrs Elizabeth Fotherington, a rich predatory widow who wants to mother him and constantly disturb him from his minor vices of playing jazz and Beethoven on his piano or drinking the odd glass of whisky. She is driving him to distraction and early one morning he goes for a restful walk in the forest when he bumps into her as she is out bird watching. Accidentally, he kills her and the rest of the story is about his terrible attempts to avoid being arrested for this crime which, at that time was a hanging offence. The story is told chapter by chapter from the viewpoint of the vicar, but also Maurice the supercilious cat that was owned by the murdered lady but who is now with Francis and also the bone-obsessed dog Bouncer, that at the start of the story is owned by the bank manager but as the story develops, is also passed to the vicar. The bishop, Horace Clinker features quite prominently in this story as he tries to get Francis transferred out of the parish. I was very uncertain how I would take to a story about a talking cat and dog (to each other, not to humans) but it is done in such a witty way that it just adds to the delightful quirkiness of the story. The historical detail is very evocative of the 1950s in which it is set. This is a story which is very short but this author can pack more into a few pages than lesser writers can do in a few hundred. This is the first book in a series that so far has reached five stories with basically the same main characters. I very much enjoyed it and the pages just flew by. Well recommended. 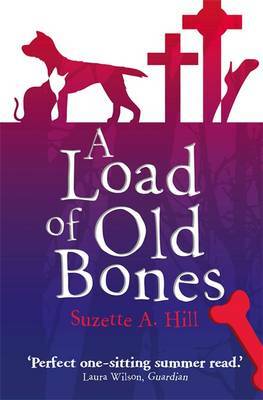 Read another review of A LOAD OF OLD BONES.